Peoria, IL - It was the final night of a 2-game home stand for the Bradley Braves women's basketball team (2-0) as they took on NCAA Division-II Lincoln University from Missouri at Renaissance Coliseum Wednesday night. Things got off to a great start for the Braves, going on a 4-0 run, which was capped by two free throws from Anneke Schlueter. That was quickly answered by a 4-0 Lincoln run to tie things at 4. The Braves dominated the rest of the opening quarter, outscoring the visiting Blue Tigers 20-6 in the last 6:22 of the opening frame, with the Braves ahead 24-10 after 10 minutes. Lincoln was able to calm the Braves offense down slightly in the second quarter, despite Bradley starting the quarter on a 5-0 run. With the Braves' lead staying around 15-20 points, Head Coach Andrea Gorski was able to utilize her bench early. By the time the halftime buzzer went off, the Braves would have not only momentum still on their side, but a 41-23 lead as well. The Braves balanced the scoring in the first 20 minutes, with Vanessa Markert, Gabi Haack, and Chelsea Brackmann all totaling 6 points for the Braves. 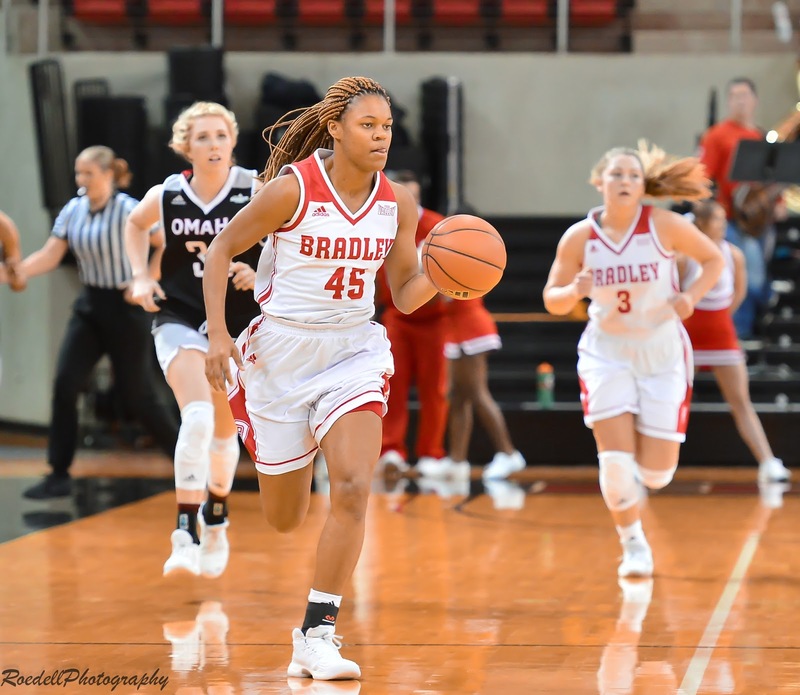 The second half saw even more momentum towards Bradley, when an 18 point lead grew to a 31 point lead when a 3-point play from Nyjah White made it 59-28 roughly mid-way through the third quarter. The lead would only get bigger as Bradley starting diminishing any last hope Omaha may have had, going on a 14-4 run to close the third frame, and the Braves would have a 41-point lead with just 10 minutes to play, 73-32. The fourth quarter was a good opportunity for Bradley to get their reserves in, and they managed to get and convert some quality looks in and around the hoop. Most notably, Amber Bozeman and Emily Marsh combined for 12 points in a combined 22 minutes between the two. Coach Gorksi believes it's beneficial for those players to get so many minutes. "They work really hard in practice. The best part about that is they go out and play hard and our bench is really excited for them and you like to see that." The final seconds ticked off, and Bradley would wind up winning the game, 88-44, tying the largest margin of victory for Women's Basketball games at Renaissance Coliseum (103-59 win vs. Eureka on 11/27/16). White finished with her first double-double as a Brave, collecting 14 points and 13 rebounds, the first Bradley double-double since Leti Lerma, who had 10 points and 12 rebounds in the season-ending loss to Northern Iowa back in March. After the game, White said that she wasn't really concerned about getting a double-double. "I was just focused on doing what Coach told me to do. Everything adds up." Gorski was glad to see her bench get some minutes, but also thought there were some things that could've improved. "We got a lot of people in there early in the first half. I thought we kind of got a little stagnant and we were trying to do a little too much 1-on-1. That's what we talked about at halftime, is making sure we don't play selfish." The Braves did indeed not play selfish, totaling 18 assists versus Lincoln's 4. Gorski praised the efforts of Nyjah White, talking about how versatile of a player she is and can be. "Nyjah's got a lot of tools. She's very athletic. Once the game slows down for her, she's going to be very, very good." Next up for the Braves is a trip down to Champaign to take on the Illinois Fighting Illini. White says that this is a big game for the team. "We're very hyped about this weekend. They're a big school, so we're looking forward to keeping our streak going. I know it's small right now, but we're looking to keep the same energy." One of the players to watch for the Illini will be Alex Wittinger. The Illinois junior will be a tough stop in the post, something Gorski believes is in the game plan. "She's tough because she can play inside and out. I think we have some players that we can throw at her." The Braves and Illini tip off Saturday, November 18th, at 2:00 pm, from the newly renovated State Farm Center in Champaign. Bradley is looking to start the season (3-0) for the first time in 13 years.